groupBy is a useful tool that mimics the “groupBy” clause in database systems. Given a file or stream that is sorted by the appropriate “grouping columns”, groupBy will compute summary statistics on another column in the file or stream. 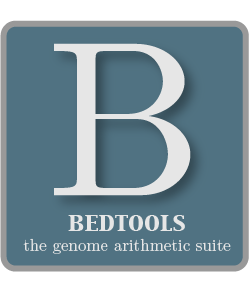 This will work with output from all BEDTools as well as any other tab-delimited file or stream. NOTE: When using groupBy, the input data must be ordered by the same columns as specified with the -grp argument. For example, if -grp is 1,2,3, the the data should be pre-grouped accordingly. When groupBy detects changes in the group columns it then summarizes all lines with that group. The input file that should be grouped and summarized. Use “stdin” when using piped input. -c OR -opCol Specify the column (1-based) that should be summarized. Required. Specify the operation that should be applied to opCol. Let’s imagine we have three incredibly interesting genetic variants that we are studying and we are interested in what annotated repeats these variants overlap. We can see that variant1 overlaps with 3 repeats, variant2 with 4 and variant3 with 6. We can use groupBy to summarize the hits for each variant in several useful ways. The default behavior is to compute the sum of the opCol. Now let’s find the min and max repeat score for each variant. We do this by “grouping” on the variant coordinate columns (i.e. cols. 1,2 and 3) and ask for the min and max of the repeat score column (i.e. col. 9). We can also group on just the name column with similar effect. What about the max score? Let’s keep the coordinates and the name of the variants so that we stay in BED format. Now let’s find the mean and median repeat score for each variant. Now let’s find the mode and antimode (i.e., the least frequent) repeat score for each variant (in this case they are identical). Now for something different. What if we wanted all of the names of the repeats listed on the same line as the variants? Use the collapse option. This “denormalizes” things. Now you have a list of all the repeats on a single line. 5.22.3 Computing the min and max. 5.22.4 Computing the mean and median. 5.22.5 Computing the mode and “antimode”. 5.22.6 Computing the count of lines for a given group. 5.22.7 Collapsing: listing all of the values in the opCol for a given group. 5.22.8 Computing frequencies: freqasc and freqdesc. © Copyright 2012. Last updated on Mar 11, 2014.